ABSOLUTELY STUNNING!!! 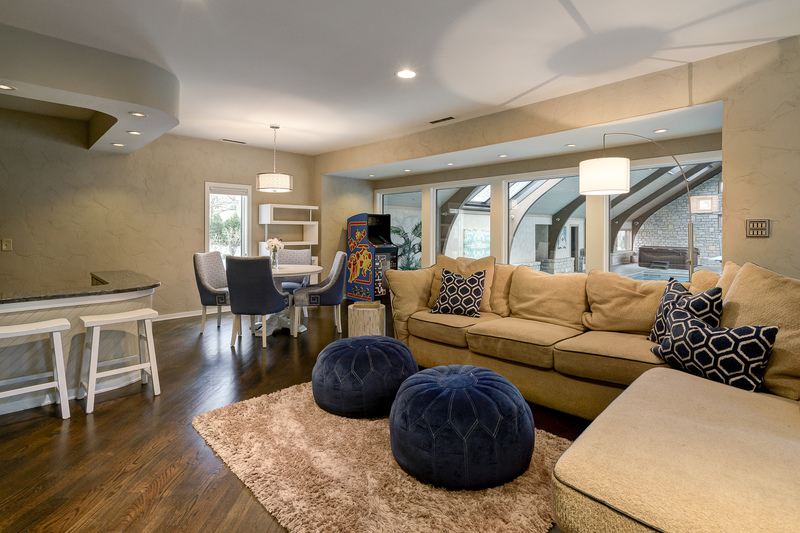 Of all the beautiful homes in the highly coveted community of Upper Arlington, this recently restored residence stands out as one of the finest! This one of a kind property has been redone from top to bottom, inside and out by a team of experts that included Jim Wright, J.S. Brown & Co., Monte Baus & Associates and Benchmark Landscaping who have transformed the home into a 21st century masterpiece of the highest quality providing crisp clean aesthetics! This exquisite home boasts 7 generous-sized bedrooms (including an apartment / in-laws suite over the garage), 7.1 bathrooms, and 10,237 sq ft of finely appointed living space complete w/an indoor swimming pool, an extensive outdoor living space all on a lot just shy of 1.7 acres! The home offers indoor & outdoor living at it's finest & fabulous spaces for entertaining! Highlighted with exceptional architectural detail, the residence includes a formal living room, an amazing center island kitchen outfitted w/beautiful cabinetry, gorgeous granite counter tops, glass tile backsplash, professional grade WOLF stainless steel appliances, a breakfast bar, pantry & a dinette. The stunning great room w/vaulted ceilings features two walls of windows overlooking the home's incredible lot enabling the woods around the home to become a permanent part of the home's environment! The home features beautiful hardwood floors throughout w/the exception of the bathrooms and the enormous 1st floor laundry room which doubles as a mud room and offers an abundance of storage. The master bedroom is a true retreat w/a 2-story wall of windows designed to make the tranquil scenery a main feature of the owner's living quarters. The room also includes a sitting space that features a wine and coffee bar, and sliding French doors that lead to the room's private terrace. The luxurious master bath features soaring ceilings, a floating island double vanity, an enormous multi-head steam shower & a massive walk-in closet! Below the owners suite is a full gym outfitted with rubber floor mats, and a wall of windows overlooking the woods beside the home. The home's additional bedrooms are all generous in size & ample closet space. Awaits the discerning buyer who demand elegance amid magnificence of nature. Slate Run is one of Arlington's most charming neighborhoods & is within walking distance to Arlington Center, a shopping center between W Henderson & Reed Rd. The neighborhood is also a few hundred yards from Northwest and Burbank Parks and a short distance from UA schools & a short 10 min. drive to the recently remodeled Kingsdale Center, a 38 acre shopping center between Tremont Rd & Northwest Blvd(the center was home to Lez Wexner's first Limited store as well as the world's first ATM) which includes a Giant Eagle Market District (an 110,168 sq ft store that features a grocery store, a café, wine & beer store, pharmacy, exotic foods, an on-site dietitian, beauty specialist, cooking classes & more). The center also features a bevy of high-end boutiques, highly acclaimed restaurants & bars, a hair salon & sap, hardware store, pet supply store, urgent care facility & much more! From breakfast at First Watch, a round of golf at one of the areas many highly ranked local golf courses, to a massage & pampering at the salon, a visit to The Original Goodie Shop (family owned bakery known for it's Cinnamon Sticks which also serves cookies, donuts & cake) or Graeter's Ice Cream, or a movie at the Lennox Town Center, it's easy to spend entire weekends close to home! Also nearby are the Shops on Lane Avenue (which includes a Wholefoods Market), or a 20 min. commute to OSU, Downtown, Riverside or Battelle. Visit the following site for additional information on Arlington & all that this Columbus suburb has to offer http://tiny.cc/upper-arlington.